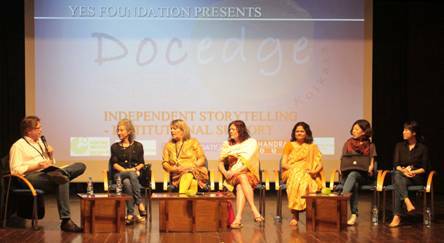 The 12th edition of DocedgeKolkata starts today. The participants and observers milled around, old friends greeting each other and fresh faces making new friends. This year saw the highest gathering of international participants till date, with about 8 international projects.Over 50 participants and observers turned up, full of excitement. 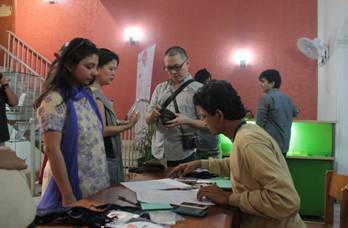 Nilotpal Majumdar and his Docedge team and also Sharmistha Sarker, Programme Officer of Max Mueller Bhavan, Kolkata and her team, greeted the participants and observers.All the participants introduced themselves and interacted with one another. 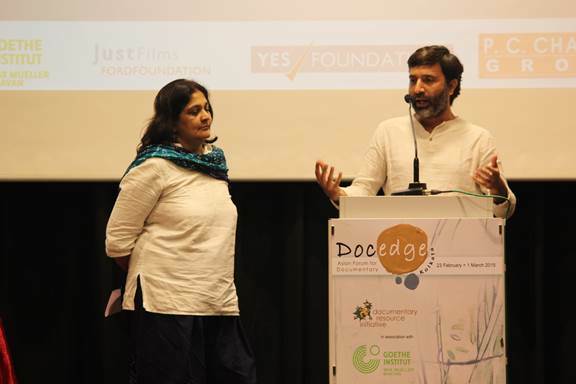 Sharmistha Sarker, Programme Officer of Max Mueller Bhavan, Kolkata conducted the opening ceremony of Docedge 2015.The guests were formally welcomed by Mr. Nilotpal Majumdar and Director, MMB, Goethe Institute and gifted bouquets. 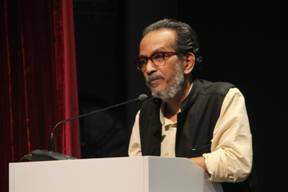 Mr. Sanjay Pattanayak,Director, SRFTI – the special guest for the evening - was also one of the speakers.The eminent guests spoke about Docedge and how it is a life-changing experience. 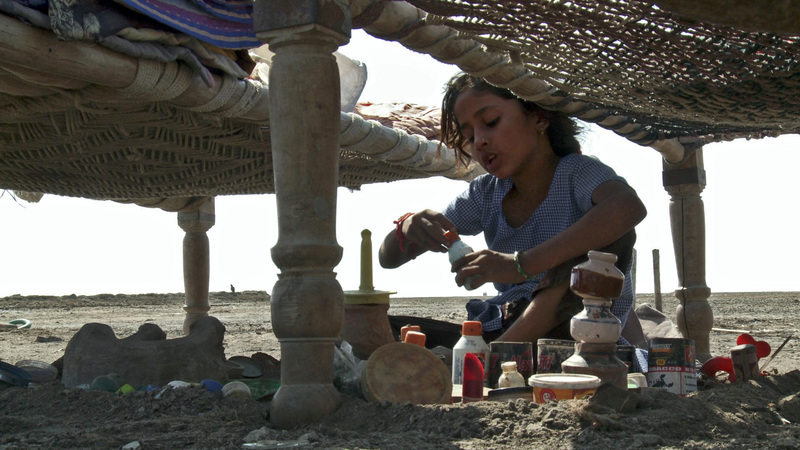 The film deals with the `salt people` of the Little Rann of Kutch, a 5000 sq.km of saline desert. These people move to the desert for eight months, extracting salt from this desolate landscape. The film follows the daily operations in the saltfields. The poetic narrative and visual language of the film shows the irony of the harsh lives of these people striving to make the `whitest` salt in the world. After a hard day`s work, Goethe Institute threw a grand opening party for everyone.People got together to continue the interactions that had started earlier during the day and made the most of the night before getting busy with work in the next few days. The day started off with the first session of pitch labs. The general atmosphere was that of nervous apprehension. Presenting pitches for the first time in front of so many esteemed filmmakers needs a lot of spirit, and our participants certainly proved they were quite up to it. 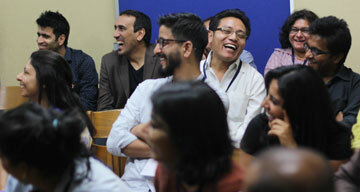 After the initial bout of edginess, the sessions progressed with enthusiasm as participants warmed up more and more. 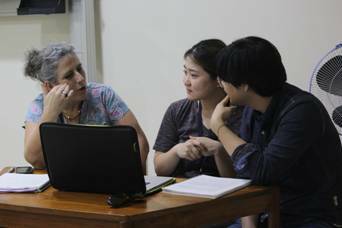 Getting to know each others` ideas and getting insights from the tutors about how to improve the pitches left the participants with a lot to ponder upon. Only at the age of 60 did the German gay film icon Rosa von Praunheim (HolgerMischwitzky, born in 1942) learn that Gertrud was not his biological mother, but that she had travelled to Riga to adopt him from an orphanage. The filmmaker goes in search of his "true" unknown parents; the search leads him through German archives and then to Latvia, where he discovers traces of a murderous German past. He discovers his mother`s identity, though she had died in 1946, and in the end, asks himself: "Do I really want to know all this?" Though Rosa von Praunheim embarks on a search for his own identity, Two Mothers goes far beyond the individual fate, leading to a moving view of German history. A complete bohemian, to be found around JawaharLal University, Delhi, RamashankarYadav "Vidrohi"lives on streets, eats anywhere, sleeps anywhere and speaks exactly what is on his mind. 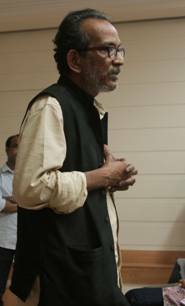 This Phd from JNU lives his life like this in protest!One of the finest in contemporary Hindi poets, Vidrohi never writes, only remembers, he has an elephant`s memory. He is the poet of our unknown, unorganised, underground nation. 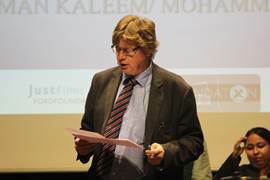 He is the poet of those whose constituency is always bearing the cost of empire-builders, the women, the children and the billions who lie on the steps to the centre of power. The film set was meant to be on a poet and his poetry. It became the story of a person who lives a poem. 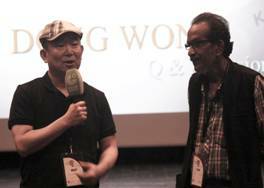 The evening saw the screening of a film by a very special guest – Kim Dong Won. This film deals with how Korean women were forced into sexual slavery by the Japanese military during World War II. Women from Korea, China, the Philippines, Thailand, Vietnam, Malaysia, Taiwan, the Dutch East Indies and Indonesia were abducted or lured with offers of work in military factories and subsequently forced into sexual slavery by the Japanese military. The majority of these women came from Korea, and this film chronicles the survivors` persistent efforts to be recognized as WWII victims by Japan and international forums. 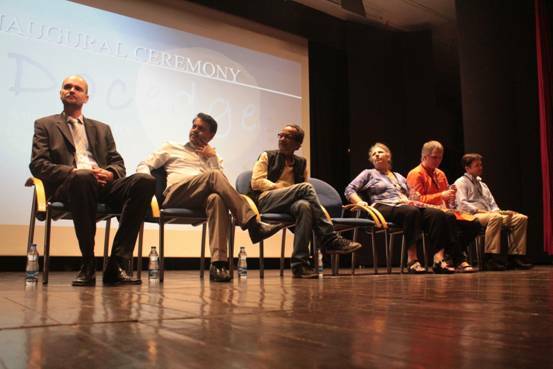 The question answer session following the screening of 63 Years On was full of queries from the audience. Kim Dong Won spoke vastly about his experiences while shooting the movie.His treatment of this film is starkly different from his other films. This aroused a lot of curiosity and exchanges between the director and the audience helped in understanding and analyzing the film better. The evening came to an end with the screening of another interesting film from India.. The film is first-time filmmaker Pushpa`s personal journey as she tries to make sense of her own life and that of her women friends. Set in a lower-middle class neighborhood in the outskirts of Delhi, it explores the lives of women who are young, educated and bright but who feel bound and helpless when it comes to making any major decision regarding their life, be it career or marriage. By following the lives of the women over three years, the film documents the changes in their lives and tries to capture the essence of their existence, sometimes through conversations and sometimes by simply observing their seemingly innocuous everyday routine. Pushpa`s own negotiations with her family, her boyfriend, and his family form the backbone of the film. 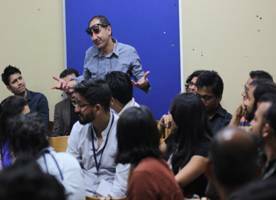 As the participants progressed into the second day of the pitch labs, there were more poised pitch practices all around. The tutors were assigned to separate sets of groups from the day before, to make sure all the participants get to pitch in front of all the tutors. New ideas kept flowing in as the initial shyness faded away. 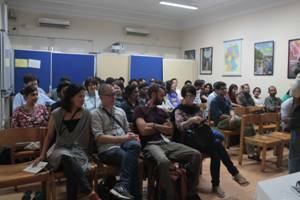 The observers also took an active part in discussing how one can improve their pitch or work on their trailers more. 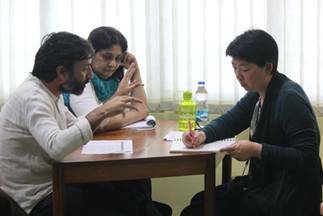 The tutors acted as a source of constant support, even taking time out from the lunch and tea breaks to analyze the scripts of the participants. 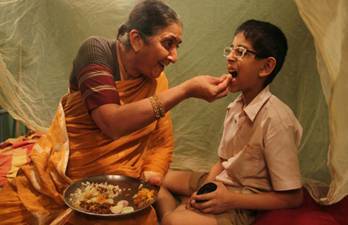 Golden Mango is the story of an eight-year-old boy craving for mangoes but cannot have any because his family is poor. To distract him, his grandmother weaves a story about a man who discovers golden mangoes in his garden. This story becomes the boy`s dream and then reality. A reversal of King Midas` tale, the script is born of the filmmaker`s anguish about children who cannot afford even ordinary fruit at a time when gold is worshipped. "Shape of the Shapeless" explores the journey of Jon Cory, aka Premdas, aka Rose Wood, through various gender and social roles, which she claims to be seamlessly fits in. By day, Jon Cory is a trained craftsperson and runs a successful business in New York City. 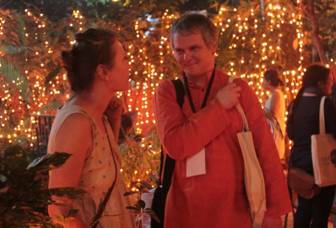 By night she is a yogi and a prudent devotee of her Guru from whom she received her ascetic name, Premdas. In late nights, she performs in various clubs around New York City as a burlesque dancer under the name Rose Wood. Rose considers her neither male nor female, and her gender is something she could write and rewrite and believes the body is just a costume. In Bundelkhand, India, a revolution is in the making among the poorest of the poor, as Sampat Pal Devi and the fiery women of her Gulabi Gang empower themselves and take up the fight against gender violence, caste oppression and widespread corruption. They want to change the unchangeable with an organized social action and unification. It`s a picture of rural India and a story about underprivileged, especially a story of Indian women.Nishtha`s unbiased camera looks at the positives as well the grey areas of this powerful, and now world-famous organization. 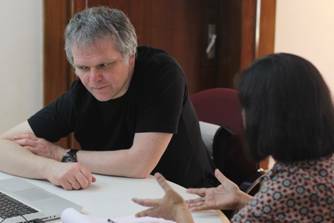 Dr. Schreiner is the Head of Programme, Culture and Science at Mitteldeutscher Rundfunk (Central German Broadcasting), Leipzig. MDR is a public broadcaster and a member of the ARD consortium of public broadcasters in Germany. The department is responsible for Factual Programmes related to History, Science, Culture and Religion –producing documentaries, features, magazines and live broadcast of cultural events. H.K. 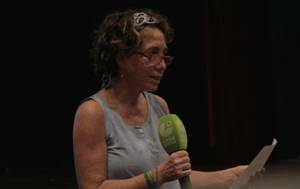 Zichrini, from CoPro-Documentary Marketing Foundation, Israel, presented the film Locked Down, directed by Liat Mer. A rare look at the interactions between inmates and wardens over a period of two years, the Neve Tirza prison for women in central Israel is the setting for a story seen through the eyes of three women: one Jewish, one Muslim and one Christian. Ethnic diversity is confined to a stifling existence in tiny cells for what seems like an eternity. These women are locked down and shut out from society and from themselves. Strong and yet vulnerable, the relationship between the prisoners and the staff, and between the women themselves is a mixture of collective distrust and mutual respect. Man at the gates of eternity. Water flows from a small pitcher. The Jordan River immerses death and it immerses life. A small oil-cross on the forehead of a newborn, the scent of God, a candle lit to show the road even when the night is at its darkest. A film about the unseen miracle of Baptism and the inexplicable touch of God. Day 3 of the pitch labs were full of activities and running around, with the participants asking the tutors for more and more guidance in order to get ready for the final pitch session. Intense discussions and changes in trailers was the general mood of the day. 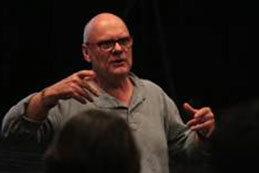 Kim`s masterclass opened with him telling the audience how he `accidentally` became a filmmaker. According to him, when he started off, he was clueless about how to make a movie, let alone a documentary. He emphasized on how one should be open-minded when `moments` come in the way. 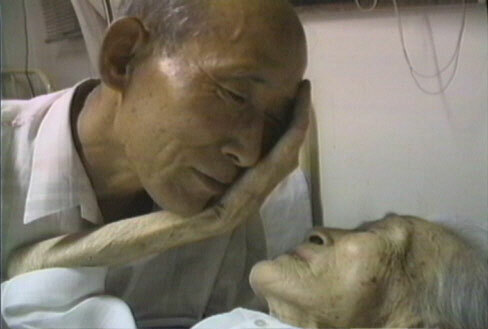 Documentary filmmaking, in his opinion, depends a lot on how one confronts these moments. A clip from Sanggyedong Olympic was screened. This was the first documentary he had shot and while he was unaware of the aesthetics of documentary filmmaking. 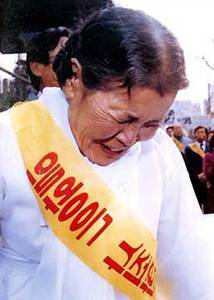 The film was widely used by activists and is said to be possibly the only film on how Koreans from Seoul (Sanggye-dong) were forced out of their homes during the 1988 Olympics. "I don`t have to run around looking for subjects, I have enough, so many that I don`t have enough time. If I don`t have a relationship with the people on whom I am making a film, I usually don`t do it. "Kim`s approach to documentaries does not fall under the general methods usually followed. He advised his audience to go and live with their subjects. This emphasizes again how important it is to build a relationship with one`s subjects. "Filmmakers should go and stay with the people they are making a film on. Do it once!" He spoke about `poor` and `poverty`. While one is a choice, the other is forced upon by outside powers that are not in one`s control. 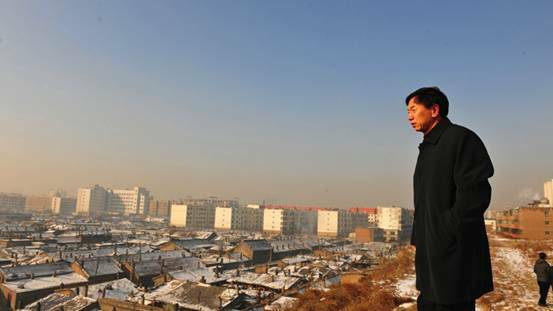 In Kim`s judgment, as a documentary filmmaker, one has to choose to be poor. 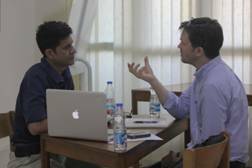 It is an important way of bridging the distance between the filmmaker and his subjects. 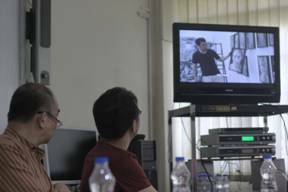 It helps in improving the attitude of the subjects towards the filmmaker and removes hesitation from his subjects, improving relationships, leading to a better rapport on screen. "As a documentary filmmaker, don`t be afraid of becoming poor. If you have no money to make, there is always a way, a will. This will make your film more democratic." 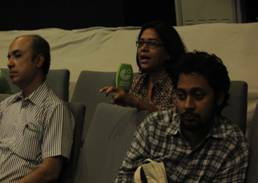 The audience jumped at the opportunity to interact with the renowned documentary filmmaker. Questions and counter questions whipped back and forth as everyone wanted to satisfy their queries in the allotted time span.Kim Dong Won stuck to his belief in working with small cameras and is currently working on his next documentary on his mentor. Mr. NilotpalMajumdar opened the discussion by introducing the members on the panel: IikkaVehkalahti, Sinae Ha, Tatsunori Ikegami. Each member, in turn, introduced themselves and the organizations they are from. 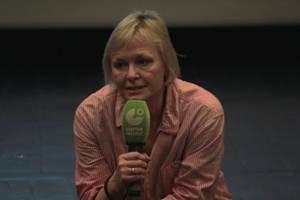 IikkaVehkalahti has served as the Commissioning Editor for the Finnish Broadcasting Company, YLE Documentaries since 1998. He has commissioned internationally awarded films like 3 Rooms of Melancholy by PirjoHonkasalo, Decent Factory by Thomas Balmes etc. Sinae Ha works as a producer and director for the production company BODA Media Group. She has a B. 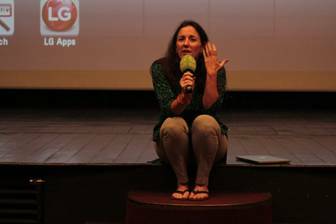 A. specialized in Television production and journalism and has worked in television production for three years, during which she developed the documentary series, Searching for Buddhism and The Last Paradise in 2006. Tatsunori Ikegami is the chief producer of Program Production for International Business Group NHK Enterprises. From 2000 to 2014, Ikegami worked as Television director for NHK, making documentaries and general entertainment programs. 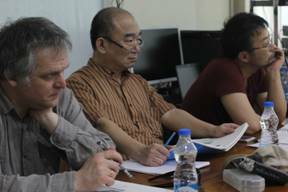 Tatsunori expressed a keen interest in working with Indian filmmakers or producers. He said that since 2009 (till 2014), NHK has worked with 207 projects around the world, out of which 10 have been with India, 8 with China and 3 with Korea. It would be possible for NHK directors to go to the Asian countries and shoot by themselves. 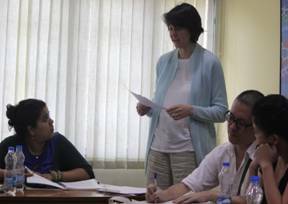 However, coming to India becomes a tough job because of language barriers. 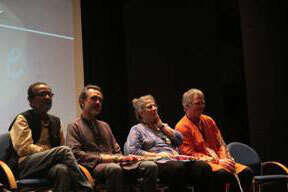 Thus, it is important to work with Indian filmmakers or recruit co-productions. Since NHK is a public broadcasting station, it is financially stable. 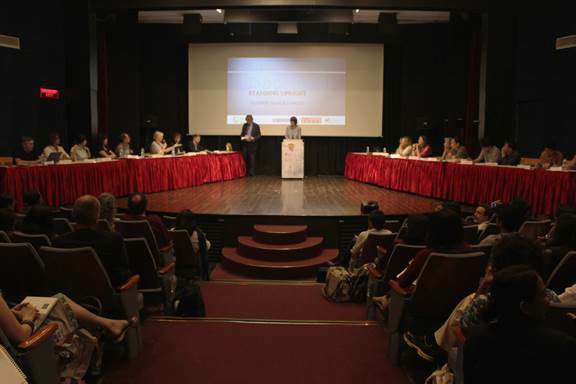 Young filmmakers are encouraged to come up with good content. 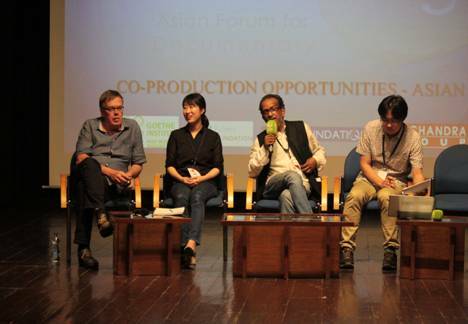 NHK is organizing an Asian pitch in May wherein they are seeking talented filmmakers. NHK is also open to working with Japanese producers collaborating with Asian filmmakers. 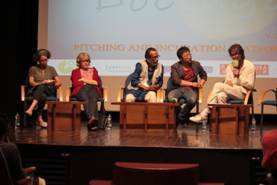 RyotaKotani added to the discussion, talking about Toyoko Doc, a pitching forum. He said a lot of excellent producers are unable to work well with others because of the language barrier. He also expressed interest in funding independent documentary filmmakers through Toyoko Doc. Sinae Ha has already worked in co-produced documentaries. The Korean government also wants international filmmakers and production houses to come in with new ideas. She spoke a little about her experience while working with NHK and how they are interested in working with the developing states.IkkaVehkalahti spoke about the European experience coming to Asian filmmakers and its impact. 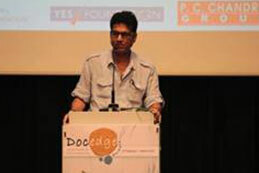 He is of the opinion that there are many films in India that have the potential to travel internationally. In Vietnam or Jakarta, filmmakers are alone which is why it becomes difficult to promote their movies. They must travel to South Asia, Korea, Japan to connect to the concerned people there. 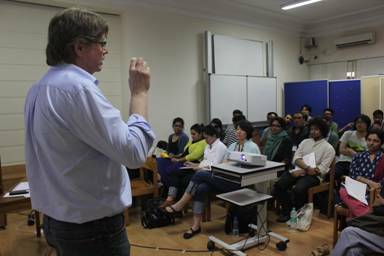 The discussion opened with Paul Pauwels, the director of European Documentary Network (EDN) and independent consultant and executive producer, mediating the panel consisting of BruniBurres, Mira Geshel, Ally Derks, PreranaLanga and Park Hye-Mi. BruniBurres has worked as a festival director and curator, media educator, creative producer and social media strategist for over 20 years. She is currently a Senior Consultant for Sundance Institute`s Documentary Program, expanding its engagement internationally with artists and institutions. 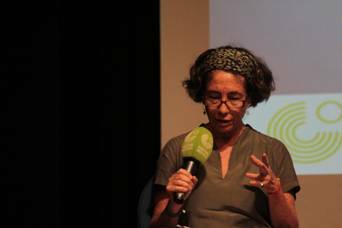 Mira Geshel is the Television and Film Executive at the Israel Export Institute.Ally Derks is the founder and director of International Documentary Film Federation Amsterdam (IDFA) and IDFA Bertha Fund. 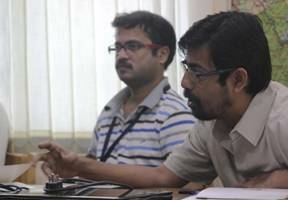 Derks has been on numerous juries –Sundance, Krakow and St. Petersberg to name a few.PreranaLanga is the CEO of Yes Foundation. 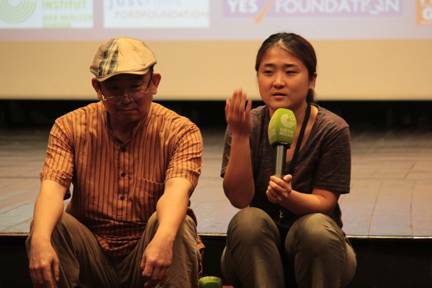 Park Hye-Mi is an associate programmer with the DMZ Korean International Documentary Film Festival. She also manages DMZ Docs Production Funds to support Korean as well as pan-Asian projects since 2011. 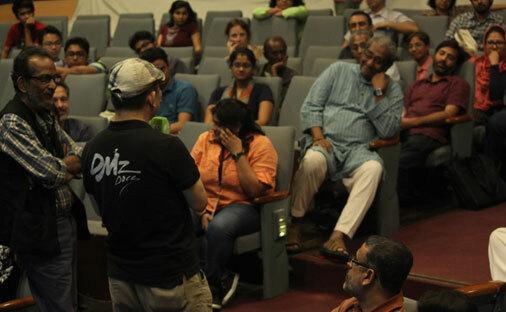 The discussion centered around how the youth can be incorporated in today`s filmmaking world. In Prerana`s opinion, there is a lot of rising talent amongst the younger generation which should be explored and given a platform for exhibiting. Yes Foundation, in fact, in 2014, had arranged for a program called YES! 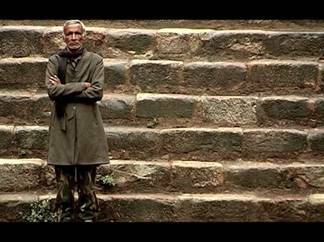 I am the CHANGE which turned out to be the biggest filmmaking initiative in India, with over 50,000 citizen filmmakers taking part. Rainer Voss used to be one of Germany`s leading investment bankers. He generated profits running into many millions of Euros. Now he talks for the first time about his work from a former trading floor at the top of a disused bank skyscraper in the center of Frankfurt. He paints an alarming picture of a megalomaniacal, quasi-religious parallel universe, hidden behind the mirrored facades. 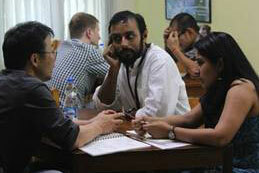 The fifth day of Docedge opened with special lab meetings of the participants and tutors. 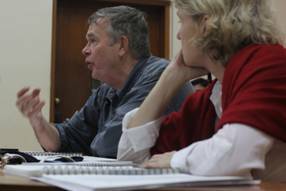 The participants wanted last minute insights into how to approach the commissioning panel and make their trailers better. The air was thick with tension as everyone tried his or her best to make use of the limited time. 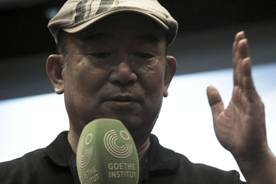 Hailed as a landmark documentary, Repatriation chronicles the lives of "unconverted" North Korean spies who were captured and imprisoned in South Korea for more than 30 years. The filmmaker developed a close relationship with them when they moved to his neighbourhood after their release from prison. This friendship eventually led him to a film project, which spanned 12 years and 800 hours of videotaping. 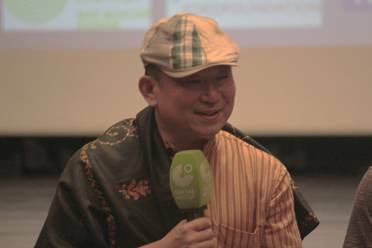 The film documents their views on Korea`s partition, their daily hardships as they attempt to adjust to South Korean society as well as their struggle for repatriation. Through this intimate portrayal, Kim offers a penetrating insight into the tragic consequences of the Cold War that still persist in Korea. The film received the Freedom of Expression Award at the Sundance Film Festival 2004. 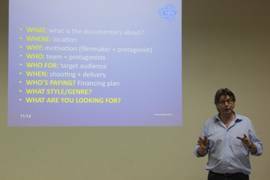 Paul Pauwels jumped in to save the day for the participants with a very informative slideshow about how to pitch. Though there are no definite rules for pitching one`s movie, he touched upon a number of norms that one could follow to ensure a successful pitch.Presenting a pitch in front of such an eminent commissioning panel can be quite nerve wrecking.The session helped a lot of the participants to overcome their anxiety of going up on stage.Paul spoke at length about how one should be organized while presenting their script, as well as the pros and cons of improvisation on stage. 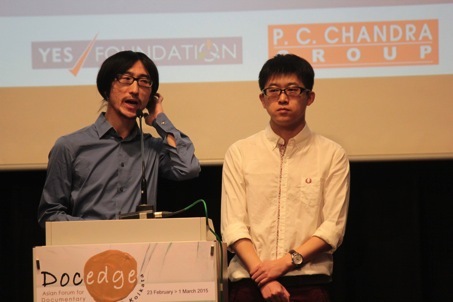 He strongly advised the participants to work on their presentation, as this was their "fifteen minutes of fame!" Queries and doubts nagging in the participants` minds were cleared out in this session. It helped soothe a lot of frayed nerves and bouts of nervousness. Mr. Nilotpal Majumdar introduced the following people on this panel:Dorothee Wenner from Berlin, Barthelemy Fougea from France,Zichrini Hatzor Katz from Israel and Seokpil Kang from Korea. 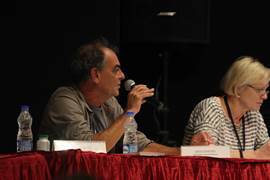 The panel mainly explored how pitching forums can come together to support filmmakers. 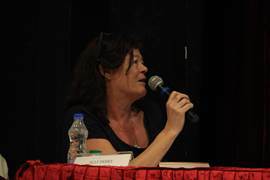 DorotheeWenner, a freelance filmmaker, published writer and curator, has been on the selection committee of the International Forum of New Cinema since 1990. Barthelemy Fougea is the producer and founder of Winds Production Company. He also represents the Sunny Side of the Doc, the international market dedicated to factual content. 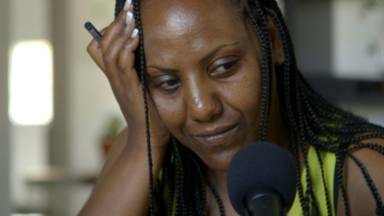 Zichrini has worked as a producer for CoPro – Documentary Marketing Foundation since 2003. 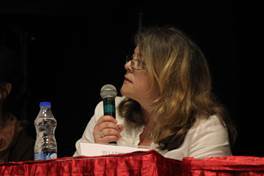 She is also the director of DocuShuk – market of completed films. Seokpil Kang is an Executive Manager at Incheon Film Commission. Dorothee explained how their structure has not yet adapted to the new face of documentaries, how there are no structures to help in understanding what is happening in the world of documentaries. 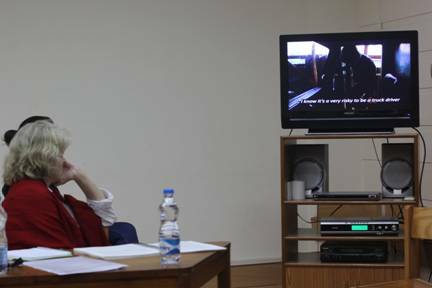 She emphasized on the need to grasp the newer realities of the documentary world. The Dubai Film Festival has decided to attach a forum and meeting ground next to the venue for visitors to interact. 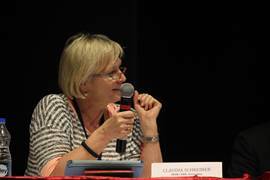 The aim is to make the documentary film industry grow in Dubai.Zichrini put in a word about how a CoPro relationship with Asian filmmakers would work out. Her company can work with filmmakers from countries they have a treaty with. 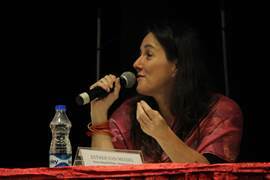 Esther Van Messel, founder of First Hand Films, handled the distribution of the film Sound of Torture. She shared her experience about how the film came to her organization. She showed the audience the pitch of the film and spoke at length about how difficult it was to promote a film that deals with such a sensitive, yet difficult subject. After five long days of hard work, the final pitching session started today sharp at 10am. Paul Pauwels moderated the session, making the participants feel at home on the big, scary stage.The Commissioning Panel consisted of eminent filmmakers and producers from all around the world like Serge Gordey from France, Claudia Schreiner from Germany, Lukasz Nowacki from Poland, Don Edkins from South Africa, Ally Derks from Netherlands, Sinae Ha from Korea, Barthelemy Fougea from France, Ikka Vehkalahti from Finland, Jo Lapping from United Kingdom, Park Hye-Mi from Korea, Esther Van Messel from Switzerland, Ryota Kotani and Tatsunori Ikegami from Japan, Bruni Burres from USA, Seokpil Kang from Korea, Ruby Chen from China and Kenny Bae from Korea.There were 12 pitches in total, followed by a round of questions by the commissioning editors. The filmmakers were ready with their answers. 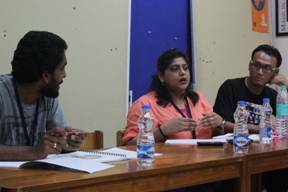 The experienced panel interacted with the participants, enquiring about their films. The air was full of excitement at the amount of positivity exhibited by the panel. The 2nd day of pitching session continued with twelve more projects. 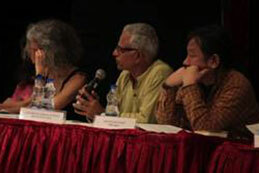 Mr. Varindar Singh Kundu, the Director General of Films Division, India joined the panel as one of the decision makers. 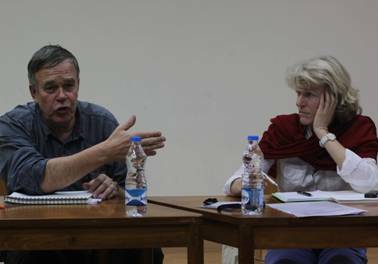 Paul Pauwels moderated the session again, skillfully making sure that the vibrancy and energy remains true to Docedge spirit. 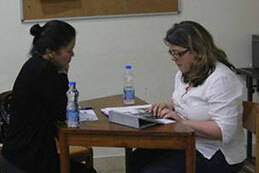 Individual meetings between the participants and the decision makers proceeded in the second half of the day. 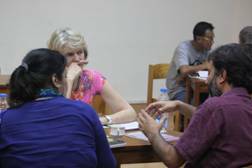 These sessions allow the participants some more time to explain their ideas better and get the all-importantfeedback. Once the thriving capital of Imperial China, the city of Datong now lies in near ruins. Labeled as the most polluted city in the country, Datong is crippled by decrepit infrastructure and even shakier economic prospects. But Mayor GengTanbo plans to change all that. His bold new plan to return Datong to its former glory, the cultural haven it was some 1,600 years ago, comes at a devastatingly high cost. Thousands of homes are to be bulldozed, and a half-million of its residents will be relocated. His success depends entirely on his ability to calm swarms of furious workers and increasingly perturbed ruling elite. The Chinese Mayor captures, with remarkable access, a man and, by extension, a country leaping frantically into an increasingly unstable future. Abu Haraz is a small village in the middle of the desert in North Sudan, on the river Nile. They are now facing a major change. The construction of a huge dam on the Nile has interfered with the age-old, natural rhythm of the lives of its residents. Their village will soon be under water. The filmmakers have spent seven years with them, observing their vain attempts to turn back fate. 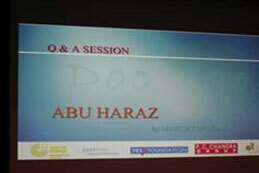 Abu Haraz is a story of tradition and culture versus economics, power and money and the insensible face of development. It is a story of pain, loss, despair and the displacement of a community whose lives rarely make it into the news. The film has won several awards and screened at and been in competition at many major international festivals. MaciejDrygas is a Polish documentary filmmaker. Following his graduation from the Directing Department of the Moscow All-Russian State Institute of Cinematography (VGIK), he worked as an assistant to Krzysztof Zanussi and Krzysztof Kieslowski. His first documentary as director was "Hear My Cry" (1991), about RyszardSiwiec, who, in September 1968, protested against communist totalitarianism by setting fire to himself (self-immolation) in front of thousands of people. The incident was censored in the media at the time. His follow-up film, “Weightless”, looks at the human cost of the Russian space programme. Drygas is currently director of the radio drama section at the Reportage Lab at Warsaw University and also teaches regularly at the Lodz Film School, Poland.